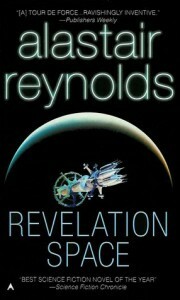 Alastair Reynolds has very good ideas when it comes to the plot of his books but I always find them slow going. Part of that is due to the number of pages as he seems to have a case of Stephenson-Martin disease, but also he's just too wordy when it comes to the science. I may garner knowledge as to the innermost workings of a hyperspace drive but is all this jargon advancing the plot? Now there's nothing wrong with hard science. I just wish there was less of it here because the author knows how to tell a story with all the twists and turns without having to lean so much on the scientific aspects.Which puts me in a precarious position as how to rate this. I'd like to give it 3.5 stars but that's only possible in a parallel universe so in this one I'll give it 4.